On 13 November 2016, Bishop Antony of Bogorodsk, head of the Moscow Patriarchate’s Administration for Institutions Abroad, while on a working visit in Pakistan, consecrated the Church of the Protecting Veil of the Mother of God in Islamabad. The parish of the Russian Orthodox Church in the capital of Pakistan was established on July 26, 2010, in compliance with the decision of His Holiness Patriarch Kirill of Moscow and All Russia and the Holy Synod. The rector of the parish of the Holy Apostle Thomas in New Delhi, India, was commissioned to take pastoral care of the local community. In October 2012, the foundation stone of the future church was laid in the territory of the Embassy of the Russian Federation in Islamabad. The construction began in 2015 and was completed in October 2016. After performing the rite of consecration, Bishop Antony celebrated the Divine Liturgy in the Church of the Protecting Veil of the Mother of God. 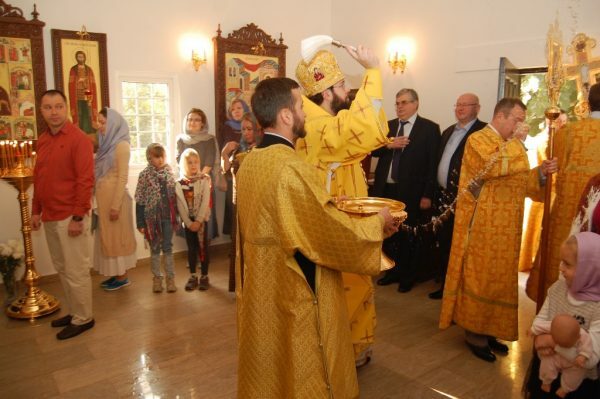 Concelebrating with the hierarch were Hegumen Serafim (Kravchenko), executive secretary of the Synodal Department for Charity and Social Ministry, and deacon Sergiy Kalashnikov, a staff member of the Moscow Patriarchate’s Administration for Institutions Abroad. Among those praying in the church were Mr. Alexei Dedov, Russia’s Ambassador to Pakistan; Mr. Andrei Yermolovich, Belorussia’s Ambassador to Pakistan; and members of the diplomatic corps. In his homily delivered after the Liturgy, Bishop Antony conveyed to the worshippers blessings and greetings from His Holiness Patriarch Kirill of Moscow and All Russia and thanked those who had made their contribution to the construction of the church. To commemorate the consecration of the Church of the Protecting Veil of the Mother of God, a tree was planted. In conclusion of the celebrations, a reception was given at the Russian Embassy. The next morning Bishop Antony departed for Moscow, website of the Church of St Catherine in Rome reports.